Exciting news has been tumbling out of the Relativistic Heavy Ion Collider (RHIC), since today morning. 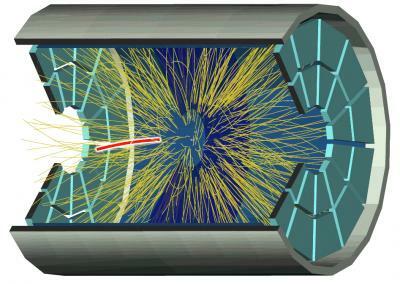 Scientists have found the distinct signature of an anti-helium nucleus, the heaviest anti-matter particle detected till date. They can also figure out the production rates and compare them to theoretical values, verifying known calculations. This is big news! Note the red line. This is the track made by the anti-helium nucleus. 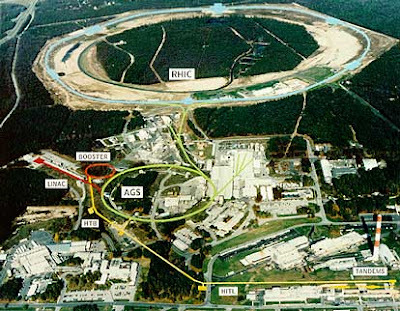 The STAR collaboration at the RHIC, Brookhaven National Laboratories, smashed together extremely fast moving gold nuclei, *producing conditions similar to that of the hot, early Universe. Out of these billions of collisions, trillions of charged particles and anti-particles are produced. The huge data sets are sifted through to identify the details of the particles and anti-particles produced. Generally, anti-matter are stable for long enough to be detected. They eventually collide with matter on the outer margins of the detector and get annihilated. Sifting through this particular dataset, the STAR team found at least 18-20 distinct ‘signatures’ of anti-helium(IV) nuclei. 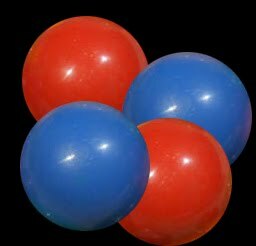 This is a bound state of two anti-protons and two anti-neutrons, having an overall double negative charge (just opposite to the helium(IV) nucleus, which is made up of two protons and two neutrons with an overall double positive charge). The data clearly shows the anti-He-3 (bound state 2 anti-protons and one anti-neutron) and anti-He-4 (bound state of two anti-protons and two anti-neutrons) peaks. The graph obtained from the dataset. Note the anti-matter peaks (purple) overlapping the matter peaks (orange). Note also the slight difference in the energy at which the matter and anti-matter peaks are located. This slight shift in energy is due to CP violation and is vital to our very existence. The STAR collaboration is jubilant about the discovery and reckons that this will be the heaviest anti-particle detected for quite some time. The next heavy nucleus of anti-lithium is 2.25 times heavier and a trillion times rarer, at least theoretically. Finding such a particle is beyond today’s technology.